Three CORD leaders Raila Odinga, Kalonzo Musyoka and recently re-elected Bungoma Senator Moses Wetangula are leading Kisii vote hunt for Bomachoge parliamentary aspirant Hon Chris Bichage (ODM). Raila who arrived in Kisii from Kisumu this morning is expected to address a mammoth rally at Gusii Stadium. According to a post by ODM Deputy Director of Communications Maseme Machuka. The CORD leader was received this morning by Kisii County Deputy Governor Joash Maangi, Senator Chris Obure and a host of ODM leaders. The PM’s entourage will address Nyaribari residents starting at Kiogoro, Nyabisabo, Nyanturago, and Keumbu among other areas. Also accompanying the PM are MPs Richard Onyonka and Simba Arati. 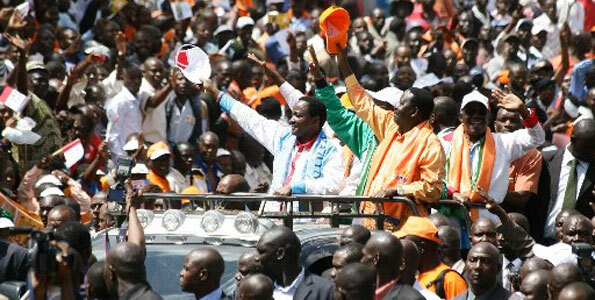 The PM will be joined by CORD co-principals former Vice President Kalonzo Musyoka and Moses Wetangula. Hon Bichage lost the seat trough a court petition.